NEW LOOK: The University remodeled the classrooms in Memorial, the dormitories, and the Learning Center. Motion detecting lights, a camera system linked to police units in the event of an emergency and a touchscreen computer system to carry out commands. These gadgets may sound like they are part of the latest spy movie, but they are some of the new features that were added to the Dooley Memorial Building classrooms this summer. In addition to $35,000 in technological upgrades in each room, the university enlisted the help of multiple design and architecture firms to give all the general-purpose classrooms on campus a complete facelift. 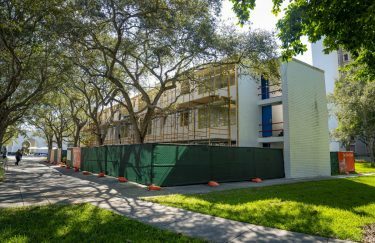 The changes in Memorial were part of a $19 million renovation plan carried out over the past two summers that included an overhaul to eight classrooms in the residential buildings and interior improvements to the Whitten Learning Center as well as a new green and orange paint job. “These classrooms were pretty shoddy. 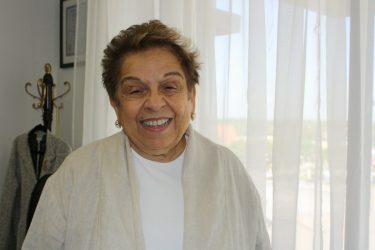 They looked like government buildings,” said Mark Diaz, the associate vice president of Budget and Planning, who pitched the idea to President Donna E. Shalala. 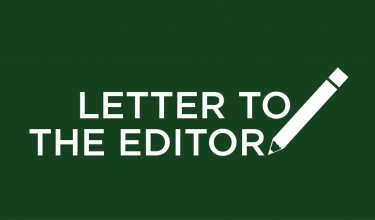 The plan, which quickly received the financial backing of the university’s Board of Trustees, was carried out with the input of professors familiar with the frustrations of teaching in these classrooms. Old, noisy air conditioners were replaced by a centralized unit. Hurricane-resistant windows were put in place and new easy-to-move desks attached to olive green cushioned seats were arranged according to two different floor plans throughout the building. A fresh coat of paint and a few convenient details, such as extra outlets for plugging in laptops, were installed. “The students who had to deal with Memorial before will be the ones who appreciate these changes,” Diaz said. 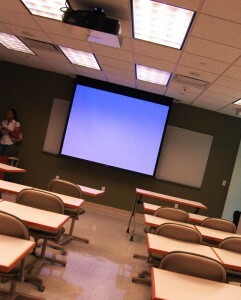 Also with the changes, professors can now rearrange classroom seating; have access to a podium equipped with a DVD, VCR and CD player; use a touch screen that controls all of the classrooms functions; and access to instant technical support at the touch of a button. “We’re now at the forefront of technology,” said Diaz, who said he was shocked to see the classrooms hadn’t changed since he had attended the university more than 13 years ago. Similar changes to Memorial were carried out in the residential college classrooms, where problems –ranging from noisy hallways to inconvenient bathroom use – have been addressed by sound proof walls and heavy doors as well as a new bathroom available without the need for front desk clearance. In addition to the bright oranges and green Ibises stenciled on the walls of the LC, new signage will be put in place to make it easier for students to find classes. “These improvements have not just been about aesthetics, they have been about functionality,” Diaz said. The university’s planning department will now turn its attention to the Cox Science building in hopes of improving the infrastructure and adding more student labs and faculty research labs.